This trail, one of the lesser known ones in the area, is located near Highland, Illinois- about 35 miles NE of downtown St. Louis. It was built by the City of Highland, which also maintains it. The trail itself isn't very long. Only 4.5 miles out-and-back, but it includes a lot of fun little features along the way. 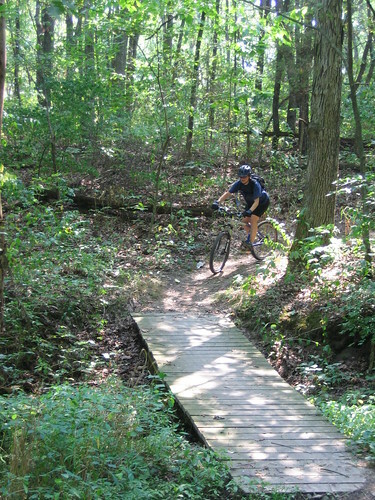 It's tight and twisty, even more so than the SIUE trails, and there are many wooden bridges, including one that's a good 40 ft. in length, so there are plenty of chances to test your bike-handling skills. It follows the contours of Silver Lake, and then has a surprisingly exciting loop with some short climbs and fast descents, which puts you within earshot of I-70 before rejoining the main trail. This probably isn't a trail you'd want to have as a frequent destination, mainly due to the lack of mileage, but if you're looking for a little change of scenery, on a fun trail in a nice setting, do a couple of laps here, head over to the nearby SIUE trails (around 15 miles away, west on 143), and you can certainly have an entertaining day. Because of its frequent crossing of low drainage areas into the lake, and the all-dirt surface, it should be avoided after rain. Otherwise, the trail is well maintained. One other thing to note is that while the trail is within Silver Lake Park, there is no swimming allowed in the lake. Interstate 70 to Exit 24 for IL 143. Go east for approximately 3 miles and cross Silver Lake. At the top of the hill is a microwave tower. Turn left into Silver Lake Park. 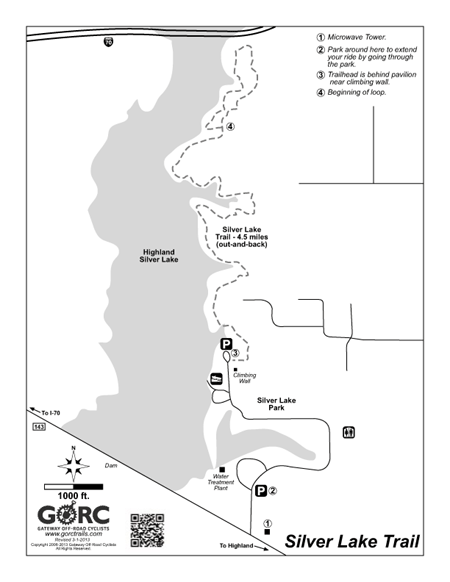 You can either park in one of the parking spots at the front of the park and lengthen your ride by about 1 mile on the pavement, or drive all the way back to where the trailhead begins at the end of the road near the climbing wall. Muddy. With the thaw and rain expected this week, it may be a while til it's ridable. With the trail being 100% dirt, it doesn't handle the freeze/thaw very well. Currently it it's not frozen and early morning, it's too muddy to ride. Pretty much ok for the most part. 3 or 4 trees down that can't be easily cleared without a saw. Super sloppy in the usual places that get super sloppy.